Add “virtual training solutions” to your 2019 resolutions. Right next to – work smarter, not harder. 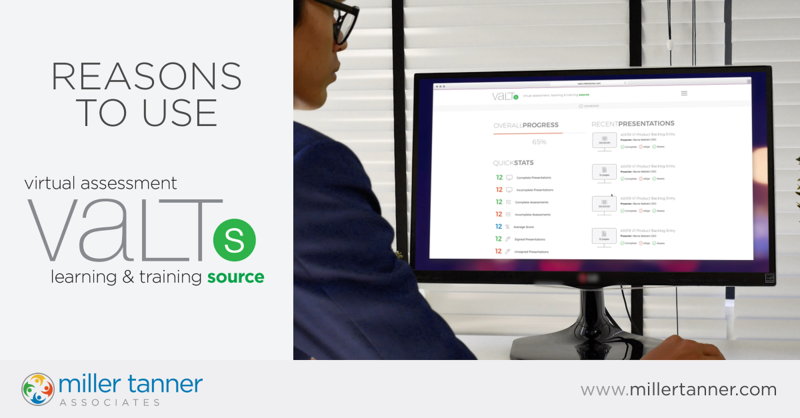 VALTs, our one-stop solution, is a Virtual Assessment, Learning and Training Source. You can essentially train on-demand, anytime, anywhere, on any device. Want to learn more? We’ve compiled 20 reasons why you should let our user-friendly, intuitive training source do your repeatable training for you. Virtual training solutions are a fraction of the cost of face-to-face training. Comparably, it is the most affordable way to train your team. 2. Repurpose content that can be used in the future for training and retraining. One of the greatest assets of VALTs is the ability to repurpose any training content and use for future trainings and updates. Organize your SOPs all in one place for easy, repeatable training every time you onboard a new employee. Your new team members have the benefit of hearing your voice and message, verbatim, as part of their onboarding training. 4. Customize the learning plan for each participant. With VALTs you can customize a learning plan for each participant or each department to better meet your training goals. 5. Refresh rapidly changing content. Time is of the essence when important updates, urgent protocol amendments, and study updates occur. Keep your participants informed by streamlining your communication through one simple, easy platform. With VALTs, very little advanced planning is required and you don’t need the extra time commitment involved in putting together a face-to-face training. With just a few weeks advanced notice, our team can create your branded VALTs learning management system and capture the content that you wish to utilize for training. Once the content has been captured and provided to our team, it usually takes between 5-10 business days to produce the catalog and deploy for review and training. 7. Improves consistency and efficacy of the message. VALTs ensure consistency of your message – no dilution and no imitations. Capture the exact content, message, and training from any meeting whether it’s face-to-face, virtual or hybrid. Your content and message will continue to be delivered by the subject matter experts in perpetuity long after the meeting. Built-in VALTs features allow you to gain better insights as it relates to your learners’ comprehension. Quickly identify gaps in knowledge and tailor your training to fill in those gaps. 9. Generate completed training documents. With the click of a button, you can see who has completed your training documents. No more searching and filing. VALTs calculates the completions for you. 10. Instantly deploys updates securely. Security is one of our top priorities when it comes to your content. We’ve gone the extra mile to develop a system that is secure. We’ve implemented a host of security measures within VALTs to maintain standards such as expiring passwords and login requirements. 11. Ability to monitor and track. Training completion can be rigorously monitored and tracked 24/7/365 to ensure that your time-sensitive updates have been reviewed by all team members. Our robust reporting tracks attendee progress in real time. 12. Supports 21 CFR Part 11 Compliance for security, electronic signatures, and records. VALTs supports compliance so that you can have the assurance that you’ve provided these critical training sessions with documented electronic e-signatures (time date stamp) and electronic records. 13. Use as a pre- or post trainer to facilitate learning before and/or after a meeting. Use VALTs as a pre- or post training platform to integrate with a face-to-face meeting for maximum effectiveness. For pharma, CROs, and biotech companies that are monitoring study site staff, VALTs offers an easy solution for site staff to review and complete the training prior to an on-site visit by the monitor. 15. Increases accessibility and overall reach. Reach those who were unable to attend a meeting in person and make training more easily accessible to your team. 16. Flexibility to train anywhere, anytime, on demand. Technology has significantly increased training capacity like never before. This offers a lot more flexibility especially when training teams that are dispersed across the globe, in various time zone, on-demand, and at one’s convenience. 17. High return on attendance. When used in conjunction with face-to-face meetings, you are more likely to get 100% attendance ratio in your meetings by recording the live event. This allows for consistent training for those unable to attend in person, when corporate team members change, or when site staff attrition happens later. 18. Allows for content diversity. VALTs allows you to engage your audience with various types of content formats including audio and video capture capabilities as well as slides, PDF documents, video, and more. More content diversity equals more engagement. 19. Deliver a personal pre-recorded message from the leadership team to your workforce. Your company’s leadership team can easily distribute and deliver important messages to their remote workforce. This makes tutorials and messages readily accessible across multiple time zones. 20. A virtual event planner will walk you through the best practices. You will have a designated virtual event planning expert who can assist you with launching your training plan seamlessly and easily. We’d love the opportunity to demonstrate VALTs. For more information, click here.